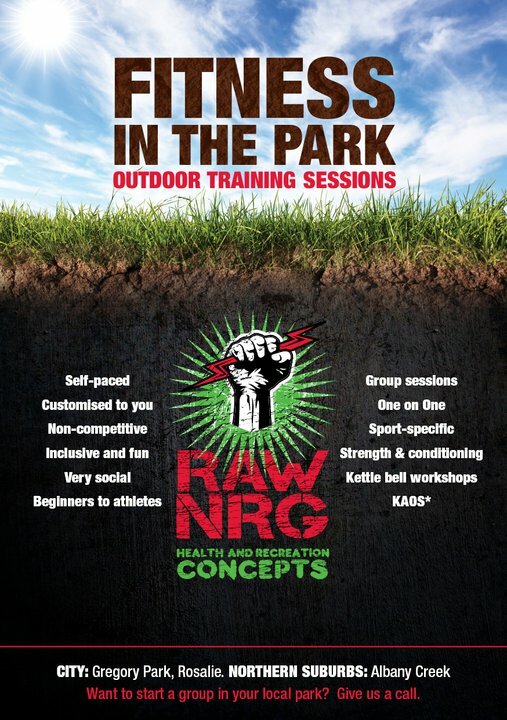 RAWNRG Personal Training specialises in innovative, functional fitness training to Motivate, Train and Inspire people to enrich their lives. Our Personal Training is attentive and focuses on the individual client needs, enabling the achievement of your identified goals.We deliver tailored, personalised training for clients of all ages, abilities and medical restrictions. We understand the challenges involved in balancing personal health with the demands of everyday life offering clients with realistic training solutions. We train to make life easy!!! 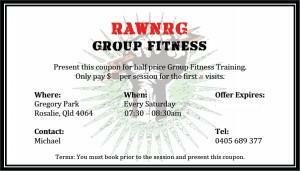 RAWNRG’s success lies in the ability to provide a variety of effective, no nonsense, functional training methods to help people reach far beyond their perceived goals and believe that goal setting is extremely important to achieve results. 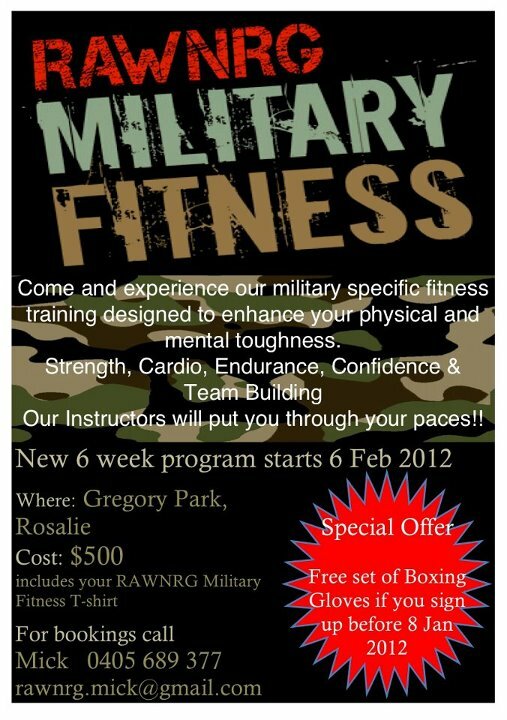 RAWNRG Military Fitness Training is designed to enhance your physical and mental toughness. You will be introduced to some of the most effective fitness and conditioning exercises such as sandbag training, rifle exercises, stretcher carry, rope runs/battling, short obstacle courses and combat conditioning exercises. If you have ever wondered why our soldiers are fit and ready to defend our country then come and experience some of those mental and physical challenges in our Military Fitness Program. You will be pushed beyond your comfort zone to fully appreciate what you are capable of. Whether your goal is fitness, conditioning or weightloss, Military Fitness will get you there. So, do you want to know what you are made of?? Strength and conditioning covers a broad range of areas and specific needs of an athlete’s development. This is done through improving strength, speed, flexibility, functional mobility, pre-hab training and rehabilitation. Our Training formats have been developed to incorporate functional movements to educate and train the client’s body to work as one. Correct training techniques are essential to RAWNRG’s Strength & Conditioning programs to ensure the client reaches their goals without injury. With a long standing passion in Martial Arts and Mixed Martial Arts (MMA) RAWNRG has developed and implemented some of the most dynamic MMA conditioning programs that have seen client’s progress from average to top level competitors in the MMA arena. The RAWNRG Training Team will develop specific training to suit each competitor ensuring his or her progress is analysed and assessed on a regular basis. Developing and providing Sports Specific Training is achieved through the breadth of knowledge and experience gained by the RAWNRG Training Team following many years of delivering training for both professional and amateur sports men and women. Sports Specific Training has been designed and delivered for clients who compete in varying disciplines such as, Running, Triathlons, PowerLifting, Road Bike Racing, Adventure Races, Rowing and Volleyball always with the same focus…… ensuring individual goals are achieved. 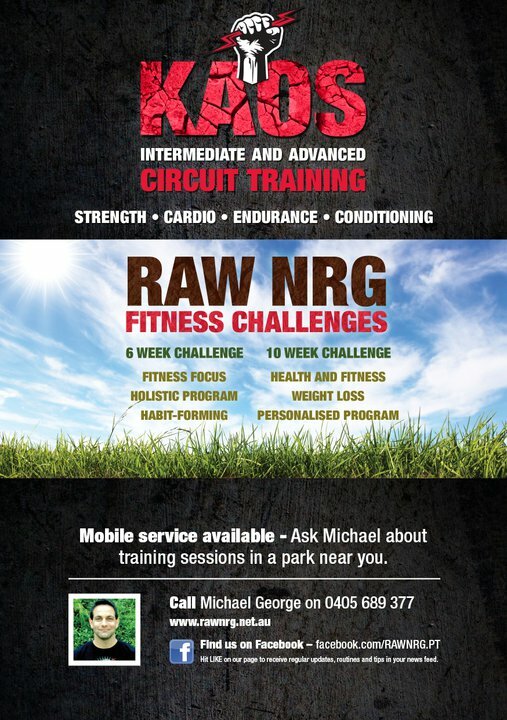 RAWNRG offers both individual or team Sports Specific Training and utilises a number of training techniques to reach the desired outcomes. Not only does the management of a clients weight impact upon their general health, it also impacts greatly on an individual’s mental wellbeing, improving mood, self esteem and assists in stress management. RAWNRG ensures client’s weight management is conducted in a respectful and supportive manner focussing on the achievement of the clients goals no matter how big or small these may be. For your peace of mind, RAWNRG have no contracts, memberships, joining fees or any other hidden charges. For bookings refer to Contact Us to either call, email or submit an online form. 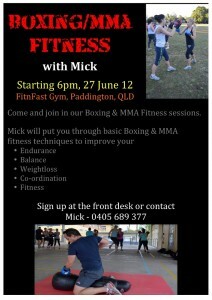 Locations: Gregory Park and Paddington, Brisbane.